I am relatively new to the Liz Earle skin care regime, I have been using their cleanse and polish, along with the toner and moisturiser for a few months now and I love it. It just makes you skin feel clean, really clean and soft. However, like I mentioned a few weeks back in a blog post, I really need a product that can firm my skin and work on those wrinkles that are slowly creeping in. I think Liz Earle Superskin Face Serum is the answer. The Superskin face serum contains powerful botanical extracts ingredients, which is fast-absorbing helping your skin look radiant and younger. It is suggested you use the serum as part of your morning skin routine, after cleansing and toning, but before moisturising. The serum has a fruity kind of scent, a little orangey, but not over-powering. I was surprised by the texture, I thought it would be quite light, but it’s thick and a fawn colour. However, when you put it on your skin it feels light, airy and smooth. The scent on your skin is stronger than that of the other Liz Earle products I’ve used, but short-lived. With the main ingredients being pomegranate flower, Persian silk tree and rhubarb extracts, it’s not surprising it’s fruity. Since losing weight, I’ve found that my skin is a little saggy and I know it’ll take time to tone up. I’m on the wrong side of mid thirties so the elasticity isn’t what it was. I’ve been using this for almost a week and of course it’s not over night success but my skin feels smoother and plumper, if that’s the right word. You use one pump of the cream and rub it into your face, it goes on smooth and feels different from a moisturiser, it feels silky. From the first use my skin felt refined, looked brighter and felt soft. I’m not expecting miracles, but it’s going in the right direction. All in all I’m enjoying using this product, the packaging is solid, sleek and classy. I love the other Liz Earle products, but this looks different. It’s in a heavy bottle, looks expensive and classy. It looks great on the dressing table. The serum feels lovely on your skin, is easily absorbed, smells great and my skin looks radiant after putting it on. At an RRP of £48, it is expensive, but it’ll last, you only need a teeny tiny pump worth and so far I’m loving it. A big thumbs up from my skin cells. Disclosure: I am a member of the Mumsnet Bloggers Network Research Panel and was sent a bottle to try, however all words and content are my own. Oooh I like the sound of this! I’ve tried (and loved!) other Liz Earle products before but I’ve never used this. I swear by the cleanse and polish stuff so I must keep an eye out for this when I next order some! I wasn’t a fan of Liz Earle the first time I tried it, but I saw this in John Lewis today and was intrigued. Interesting to hear that it’s giving good results. I’m also trying it out as part of this review and was really happy with the texture – it is very creamy. There’s no water – y – ness in it. Does that make sense? !!! 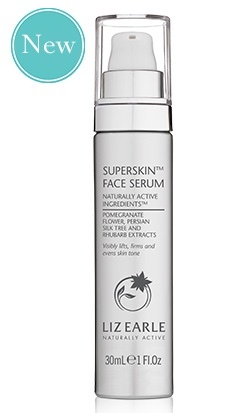 My write up is at http://www.cambridgemummy.co.uk/2015/09/liz-earle-superskin-face-serum-review/ – please come and leave a comment with your link and I’ll add it into my post. Morning! I totally agree that it has a stronger scent than the other Liz Earle products. I found it confusing at first – I wasn’t sure if I liked it or not. I’ve now told myself that it’s because it’s stronger, more concentrated, stuff so that’s why. I love my over analytical thinking on this…..